When your old ‘do just isn’t cutting it anymore, make a beeline for the Sally Hershberger salon. The creator of Meg Ryan’s famous shag cut, Hershberger has garnered a serious Tinseltown fan base, which includes Jimmy Fallon, Kristen Stewart and Amanda Seyfried. The queen of coif’s Los Angeles flagship is perched on La Cienega, where she whips up hair magic alongside a talented team of artists, including colorist Cassondra Kaeding (base color starting at $150). A coveted appointment in Hershberger’s chair will set you back $800, but the results? Priceless. 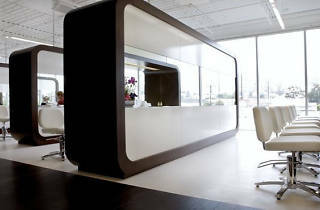 One of the most high-end salons in LA. It's not wonder that Hollywood's elite always frequent this place. It is definitely pricey, but worth it for a guaranteed, positive hair cutting experience.